CourseVector’s team of security experts receives scam emails almost daily. We know it is becoming more difficult to tell the difference between scams and legitimate email requests. If you are in doubt about any email that you receive, forward it to support@coursevector.com and one of our technicians would be more than happy to provide you with comments and recommendations. This is free to all CourseVector and PA State Association of Boroughs accounts. We want to help you become savvy to what is a scam and what is a legitimate email. Below, you will find examples that we or our clients received. 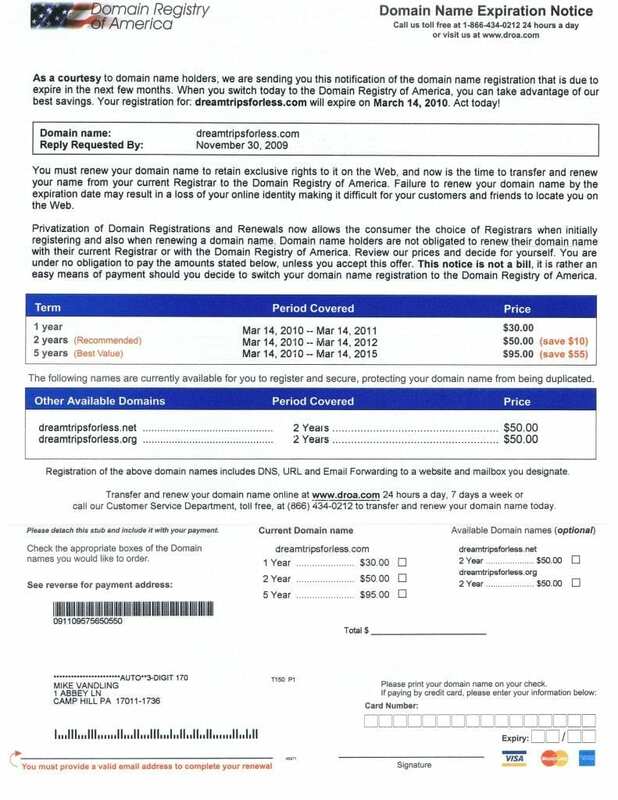 Scammers have started filling out request forms on legitimate websites with legitimate email addresses (yours). Because the website is legitimate and the email address is legitimate, these bogus requests are able to bypass spam filters. If a confirmation email contains a link in the “from” field, it’s likely phishing. An example would be “Dear CourseVector [malicious link]”. If you receive an email from a website that you did not sign up for – stay safe. Do NOT click on any links in the confirmation email. Instead, type in the website name yourself to verify its existence and then contact them and let them know that you didn’t fill out their form. It is commonplace to see several emails in your inbox from Amazon. However, make sure that they are legitimate before clicking on them! Note: Go to Your Orders to see if there is an order that matches the details in the email. If it doesn’t match an order in Your Account, the message isn’t from Amazon. Note: Go to Your Account and select Payment options. If you aren’t prompted to update your payment method on that screen, the message isn’t from Amazon. You can actually report spoofed Amazon phishing emails to Amazon! One place people may not expect to be scammed is during a job interview. However, it happens! Prospective employers are not going to ask you to download anything special for the interview process. If you are asked to download something during a job interview, don’t – especially if you are using a government or employer computer for the interview! 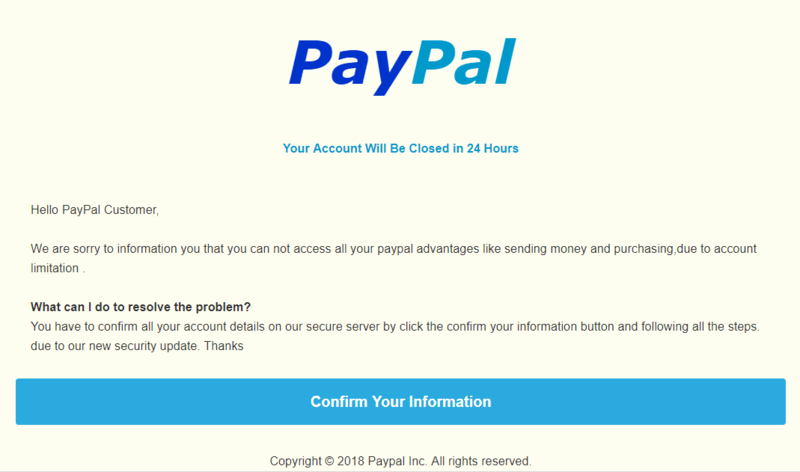 As if it’s not difficult enough to tell the difference between a legitimate email and a phishing email, cyber criminals will often steal logos from real companies to make their scams look real. How do you keep yourself safe? 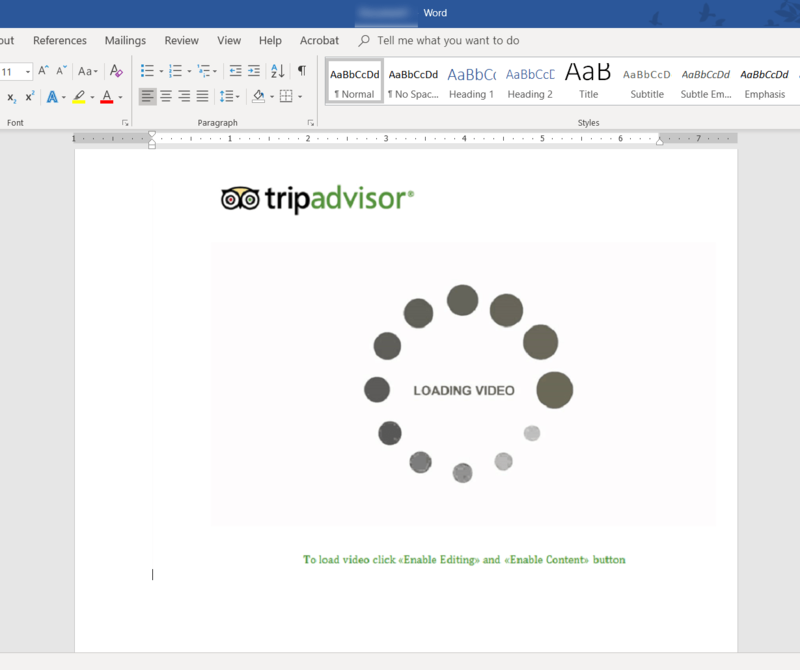 Companies like Norton and TripAdvisor won’t send you videos or files via a Word Document. Most companies want you on their site or sent standard alert boxes. 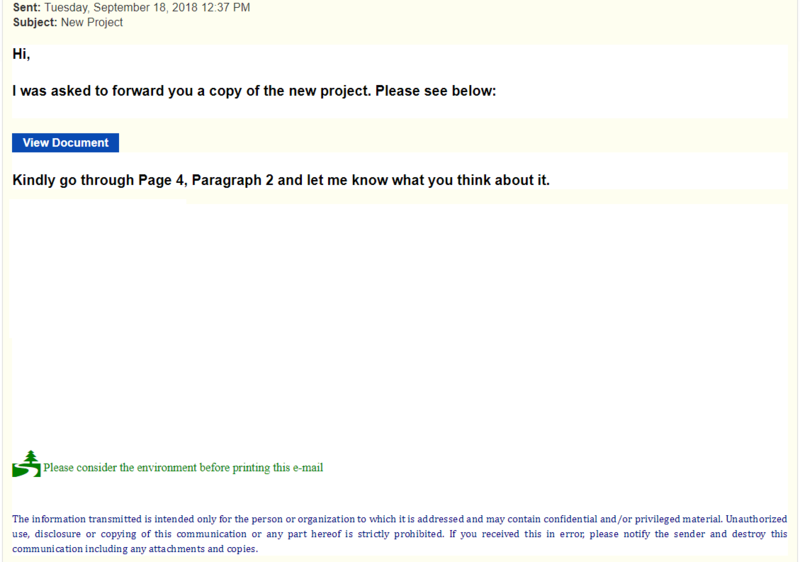 These types of message will not be sent in a Word Document. If you receive one, delete it immediately. We are migrating all personnel email accounts to Staff Outlook 2018 desktop e-mail and as such, all active staff members must check and log in for the upgrade and migration to take effect now. This is done to improve security and efficiency due to recent spam received. Open it in a sandbox to make sure it does not contain a payload. If you are not able to do this, ask IT for help. Follow up with the sending firm (which WAS legit in this case) rather than clicking on anything in the Email. 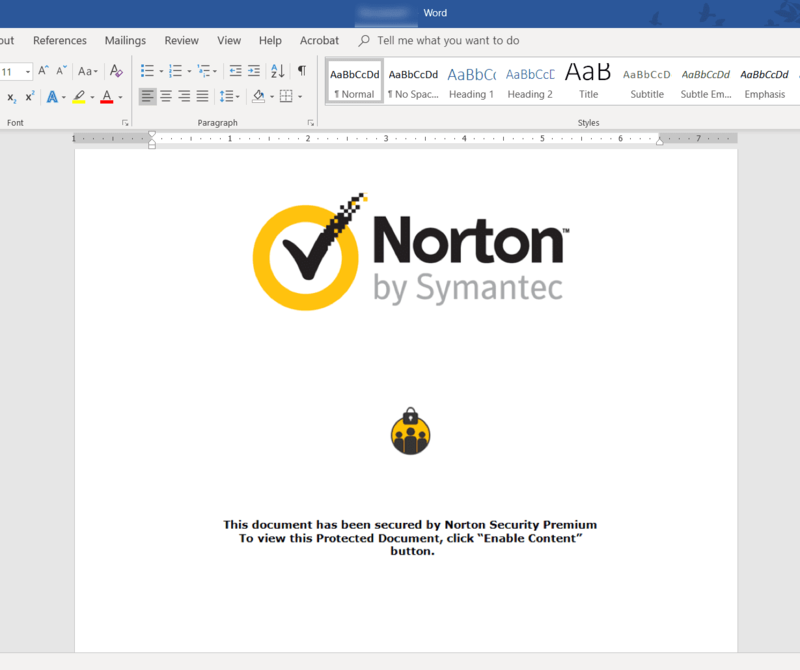 Enabling macros through an application such as Microsoft Word can spread a virus. 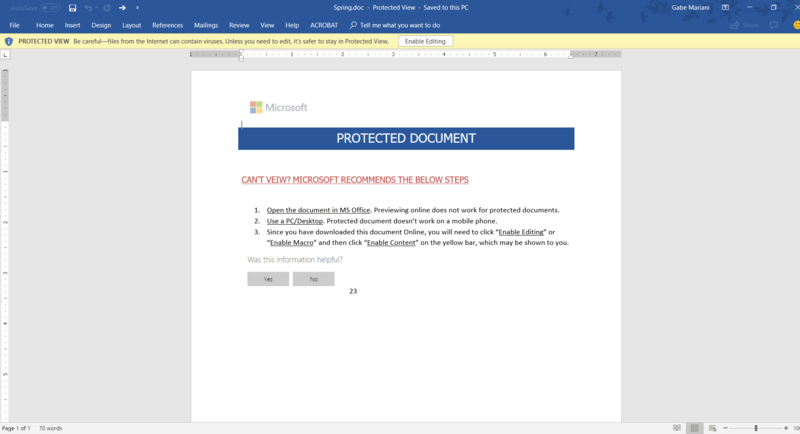 When you enable something like macros, it allows for the language of the application (in this case Microsoft Word) to reach out to the internet and install a virus. Keep these things in mind the next time you are prompted to enable macros on Microsoft Word or any application for that matter. 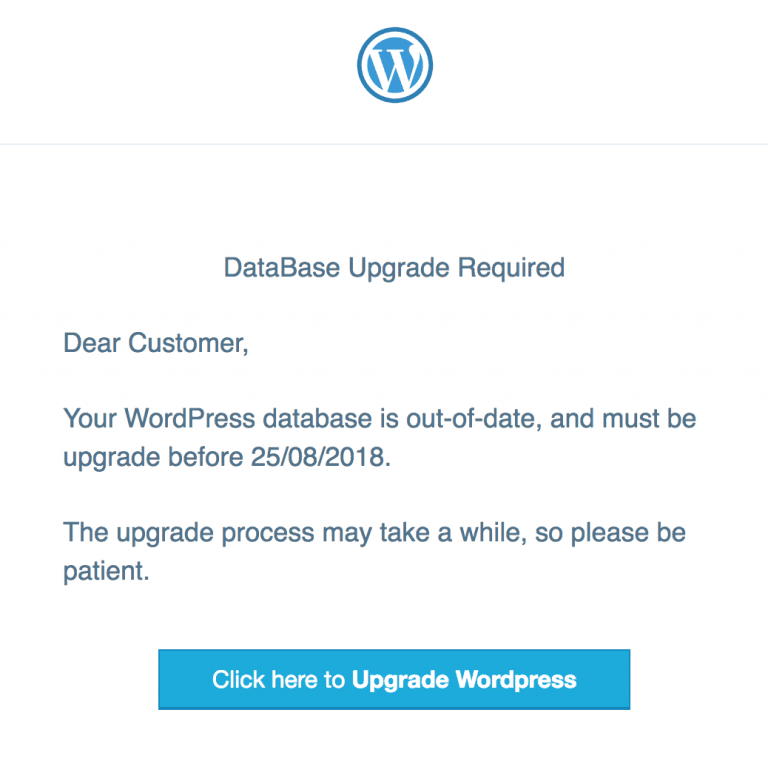 Emails are being circulated telling customers that their WordPress installations need to be upgraded. As with many scam emails, there are many grammatical errors. 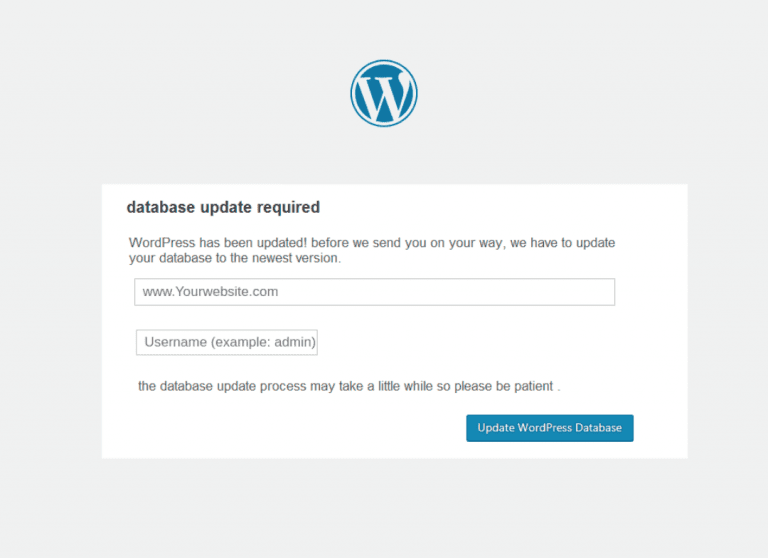 The “Click here” box takes the user to a phishing page, asking for WordPress credentials. 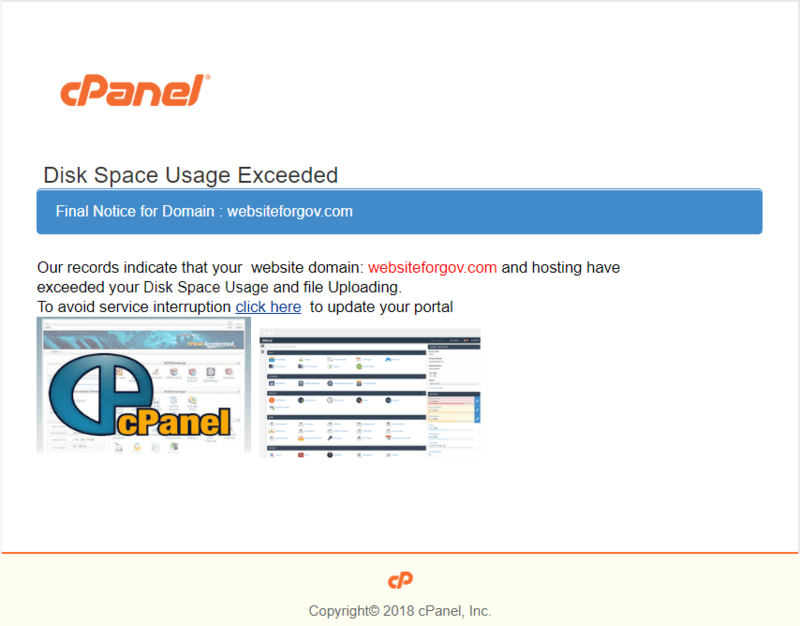 We received this email from “cPanel” stating that our website was going to be shut down. Now, we know that our website is not going to be shut down because we host and control it. But, should you ever receive a message like this, here are some things to watch out for. 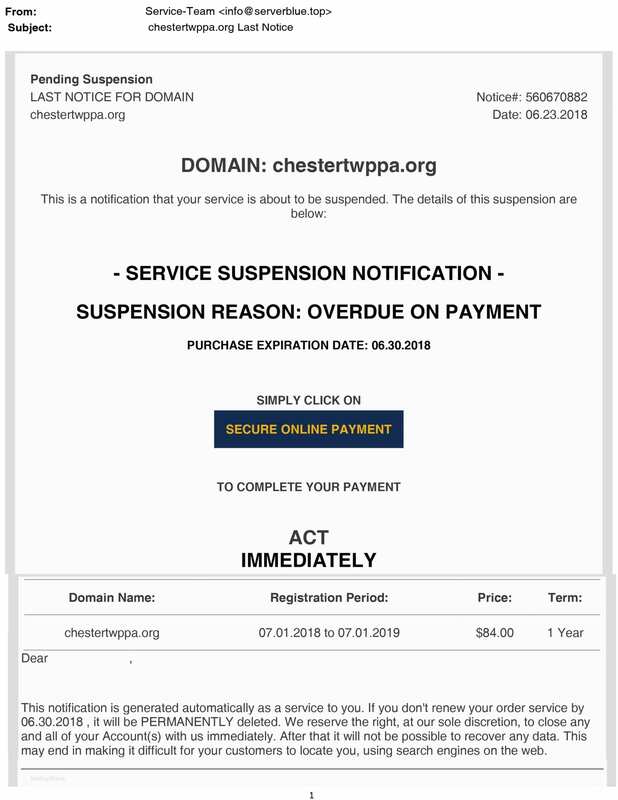 If we host your website, website suspension emails are going to come from CourseVector, not cPanel. But, if you see this and feel panicked, here are some things to look at. 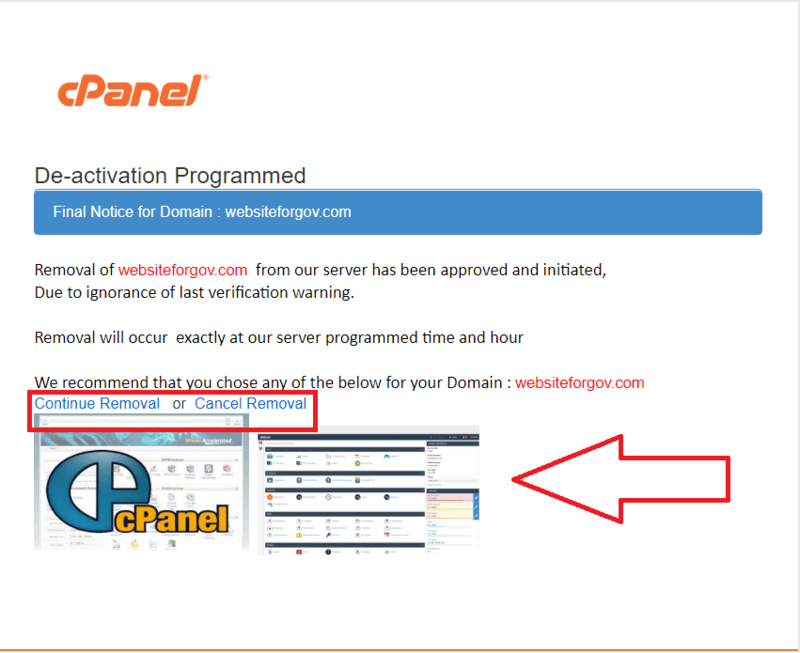 They make it seen pretty official with real screenshots of cPanel. 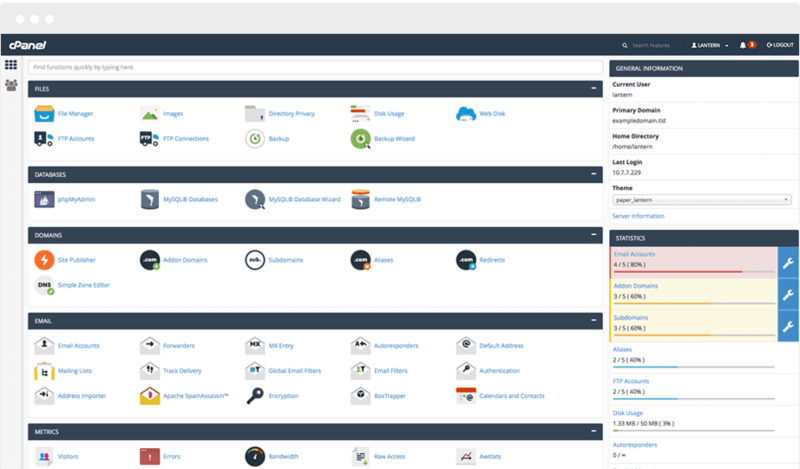 However, this is not a screenshot of YOUR cPanel account! If you look closely, it’s a dummy account. Additionally the links are fishy. They do not go to a CourseVector website, which they should since we are the host. When in doubt, contact your website host before clicking on anything! 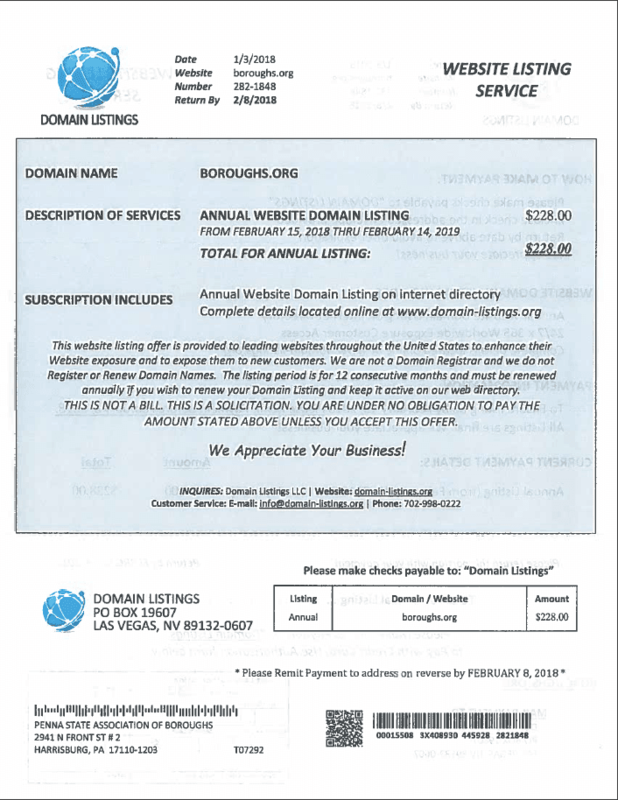 Many domain name registrars send out notices, and bills, even though you do not have your domain name registered with them. Worse, they tend to charge more money, and, sometimes they can tie up your domain name to the point where you end up losing it or paying an extraordinary sum of money to get it back. For most clients, your web site included a domain name and is included and paid for with your annual fee. 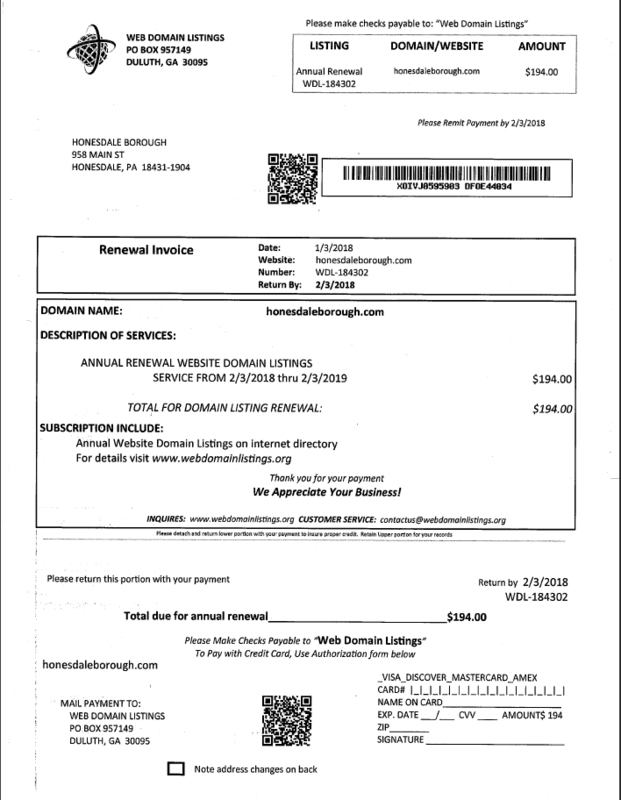 If you get a domain name renewal notice or bill, please do not renew or pay without checking with contacting us. We will be happy to assist you in whatever way we can. For the record, a domain name should only cost approximately $12. Normally, the companies that send out notices charge significantly more. 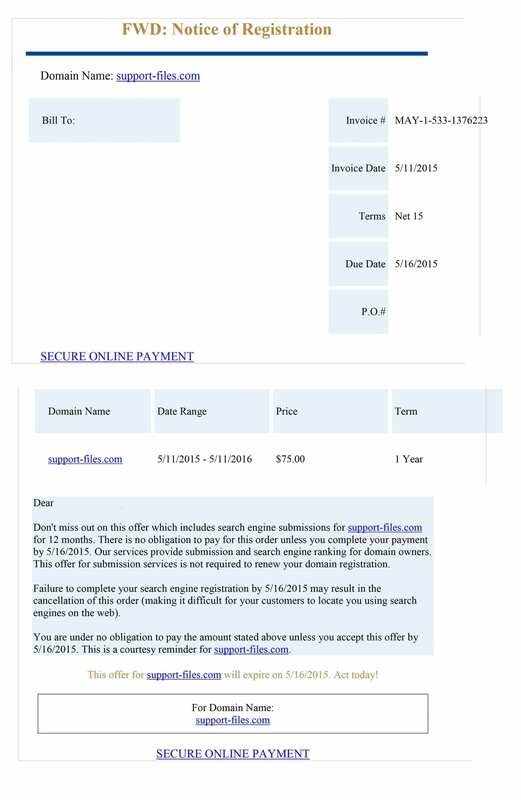 Following are examples of domain renewal notices that are not legitimate. We will be posting more as we can.